Fairly low growing with thin soft needle like&comma; dark green leaves which have a peppery taste. Slightly sweeter than the winter variety with pale lavender or white flowers. Can be used in stuffing's and stews to help make sauces and oils. 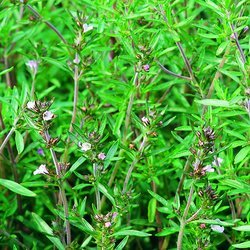 Savory is said to help aid digestion&comma; flatulence and to help repel insects. Roughly 4 weeks after planting.